Burnt wooden matches have been favored for creating craft items for many years. There are different sizes of wood matches and the ones used on a project depend on the size of the item being made. Matches are first lit and extinguished quickly so one end has a burned black end. These are placed together in patterns and glued on wood boxes, picture frames and other boxes. Matches typically referred to as fireplace matches are five to six inches long. These can be used whole or cut shorter to match the kitchen matches, which are three inches long. Regular size wooden matches are 1 to 1-1/2 inches long. All of the matches that will be used must be struck and blown out to create the blackened end. The burned ends should be wiped off on a paper towel to remove any loose soot. Any craft project created with the matches should be planned out on paper. Graph paper is good for this, but drawing a square or rectangle on plain paper is fine. Small wood boxes can be purchased at all craft supply shops. Small paper board boxes that jewelry came in or cigar boxes will work also. Any regular white glue is fine for gluing the matches to the box. Measure the sides, top, front and back of the box. Draw a square or rectangle on plain paper that is the exact size you measured. Use a separate sheet of paper for each drawing. 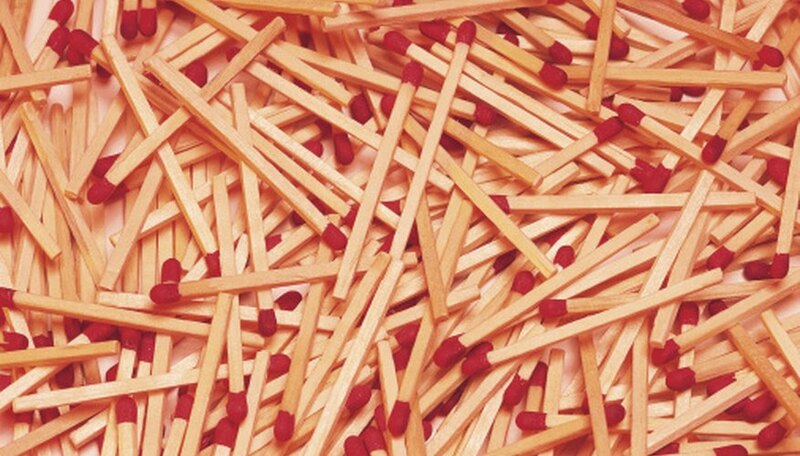 Lay the burnt matches on the diagram, creating the pattern desired. A star, cross or other design can be created in the center of the section by placing the matches with the burnt ends in a position that creates the design. Fill in the rest of the section with plain matches. Use a sharp knife such as an exacto knife to cut pieces that need to be trimmed. Once a diagram is complete, cover that side of the box with glue and transfer the matches to the box. Simple flat wood picture frames work best for this project. Draw an outline of the picture frame on a sheet of printer paper. Create the design by placing the black tips of the matches in the desired pattern. This can be a line around the inside and outside edges or a zigzag pattern down the center. Alternate a burnt end with a plain end in an attractive pattern. Hearts, diamonds, crosses, stars or even a name or initial can be created by the placement of the burned match ends. Fill in spaces between and around the design with plain match sticks. Cut the burnt end off if more plain sticks are needed. Apply regular white glue to the frame and transfer the matches one by one to recreate the pattern of the frame. Allow the glue to dry completely. Trim any edges that are extended out on the edges. Be careful to not pull any matches loose. Use a fine sandpaper to smooth the top of the flat surfaces and all the edges. Brush a coat of clear lacquer or varnish on all the match stick surfaces. Allow it to dry according to the lacquer or varnish directions and then apply a second coat. When this has dried, line the inside of the box with velvet, satin or felt. Gracie Sprouse has been writing professionally since 1976. Her areas of expertise are in antiques, crafts, real estate, income taxes and small businesses. Her education consists of an Associate of Applied Science with a business and accounting major from Piedmont Virginia Community College.